FORT WORTH, Texas (Nov. 8, 2017) – Representatives from eight different conferences comprise the Davey O’Brien Award’s Great 8 for the 10th week of the college football season. Fifty-four different quarterbacks have now earned the honor through the season’s first 10 weeks. The eight honorees, as determined by voting from the award’s selection subcommittee, are: A.J. Erdely of UAB, ULM’s Caleb Evans, Luke Falk of Washington State, Oklahoma’s Baker Mayfield, Frank Nutile of Temple, Iowa’s Nate Stanley, Jarrett Stidham of Auburn and Toledo’s Logan Woodside. All 130 FBS quarterbacks are eligible for the weekly honor. 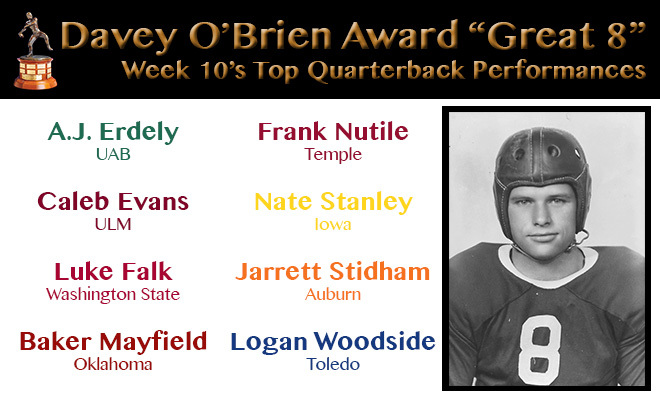 The winner of the Davey O’Brien National Quarterback of the Week Award, which will be one of the week’s “Great 8” quarterbacks, will be announced Thursday.